Political leaders in Cape Town, South Africa, realized that climate change was a threat years ago. So they focused on conserving water, and their efforts won international attention — and awards. 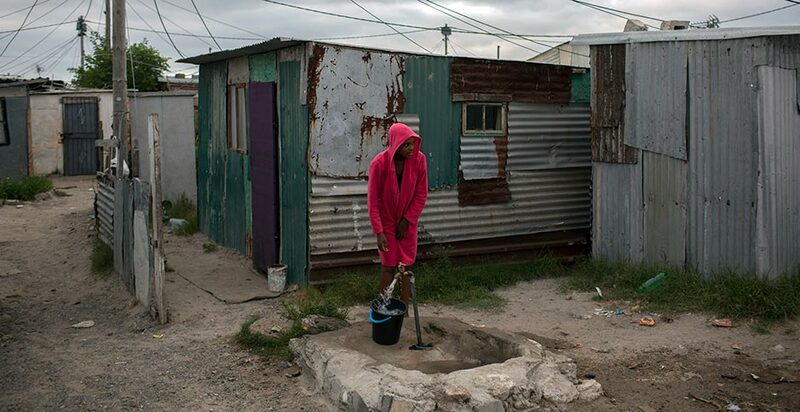 On Day Zero, about three months from now, Cape Town will shut off its spigots, an almost unfathomable step for a major city of 4 million people. And it might presage something bleaker for other regions that are grappling with the challenges of strained infrastructure and the effects of rising temperatures. Three years of intense drought has drained the reservoirs that supply the city of Cape Town, a multicultural metropolis sitting on a hooked peninsula that juts into the South Atlantic Ocean. The reservoirs are down to just 26 percent capacity. 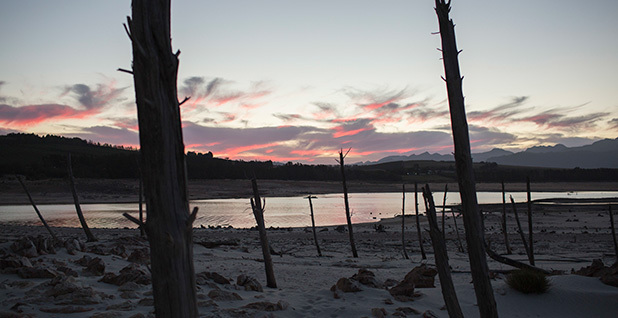 It's lower at the Theewaterskloof Dam, the city's primary source of water, at just 13 percent. Stretches of dry lake bottom lead to the disappearing ribbon of water behind the dam. Earlier this month, daily water limits were cut from 23 gallons per person to 13 gallons. 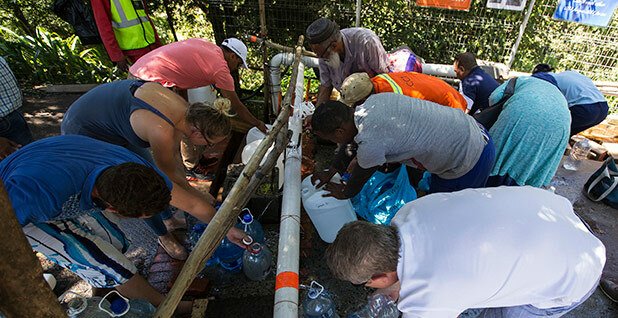 When Day Zero arrives — now estimated at May 11 — Cape Town engineers will turn off the taps, reawakening them temporarily for essential services at hospitals and other critical facilities. Residents will be faced with traveling to one of about 200 distribution points for their daily allotment of water. Politicians are openly voicing concerns about "anarchy." The crisis in South Africa could foreshadow future events that may cripple urban centers by depriving residents of water access. That threatens personal survival, in the most dangerous form, but it can also throw crucial functions into chaos, from transportation systems to energy generation, experts say. Climate change promises to sharpen those pressures on water resources, said Betsy Otto, director of the World Resources Institute's Global Water Program. In that way, Cape Town is sounding an alarm. "A lot of cities should be paying attention to this and see it as a future warning sign for why they need to really pay attention to how water cuts across everything that they do, basic life and activities," she said. Many parts of Africa have become drier and hotter as a result of climate change, scientists say. Political leaders in South Africa focused on conserving water, rather than on a broader strategy across society, said Francesco Femia, president of the Center for Climate and Security. The severity of the problem demands attention from all layers of government, local and federal, and requires more than an environmental response, but one from sectors that also include agriculture and electricity. The plan failed to go beyond addressing wasted water. "For countries, the really important thing is to start thinking about climate change in a much broader way and dealing with it much more holistically," Femia said. "It's still the realm of what many in national governments consider to be the low-level, low-politics ministries, and I think that's part of the issue." That a major city — in this case, a tourist jewel with a booming economy — would shut off its taps is almost ungraspable. Climate change can act as a threat multiplier, turning extreme drought, which happens in natural cycles, into a potentially deadly situation. Although Cape Town's leaders have recognized the threat from climate change for years, even winning an international award for water conservation at the Paris climate talks in 2015, they neglected to prepare for the direst possibilities, Femia said. They successfully reduced water demand, ultimately saving more than 30 percent. While that's impressive, the national government could have also diversified its water sources by drilling wells or connecting to supplies beyond the reservoirs, experts said. Meanwhile, the agricultural sector, which includes a wine region outside the city, did not adequately reduce its consumption. "In this case, water conservation is absolutely necessary, but the water supply is not diverse enough to help in this kind of case," Femia said. "There is no contingency plan for what happens when we run out of water." While scientists see connections between climate change and the crisis in Cape Town, there are other precursors. Some of them are political; others are related to engineering. The city's infrastructure is incapable of handling the severity of the challenge, observers say. A lack of public planning and a long-lasting population boom are key drivers of the problem. In that way, Cape Town underscores how climate change can expose political passivity, observers say. Other major cities might run out of water because policymakers are inadequately preparing for the profound ways that climate change could amplify weaknesses in public planning and cycles of natural disasters, like drought. Cape Town has been transformed in the last few decades. The city's population has boomed since the 1990s, growing 80 percent, according to NASA. At the same time, its water capacity has grown by just 15 percent. Cape Town's vulnerability to drought is largely a consequence of population increases and real estate development, said Peter Johnston, a climate scientist at the University of Cape Town. The science does not necessarily indicate that droughts will become more frequent in the future, he said. However, when natural drought cycles are intensified by rising temperatures and increased dryness of the soil, it could lead to water shortages, he said. "Certainly, as urbanization accelerates continentwide, the pressures on urban resources will increase," Johnston said. "We have seen increases in climate variation, with an increased frequency of droughts and floods, in many countries. If the standard of living is to increase, the supply of water needs to be secure, and this will require the incorporation of long-term planning." Some minor relief is on the horizon. The rainy season runs from May to September. Desalination plants are under construction, and a new project, with a targeted completion date next year, would divert more winter water runoff into the city's water supply. Those steps won't overcome the long-term risks from climate change, experts said. While the rest of the world is trying to stave off global temperature increases above 2 degrees Celsius, parts of Africa could hit that by midcentury. By the end of the century, some areas could be 6 degrees warmer if greenhouse gas emissions continue unabated, according to the Intergovernmental Panel on Climate Change. South Africa, particularly the southwestern part of the country, where Cape Town is located, could see less precipitation, the IPCC found. Over the next century, dry spells are likely to increase while wet years decrease. "Water resources are subjected to high hydro-climatic variability over space and time, and are a key constraint on the continent's continued economic development," says a recent report by the IPCC. "The impacts of climate change will be superimposed onto already water-stressed catchments with complex land uses, engineered water systems, and a strong historical sociopolitical and economic footprint." Elsewhere on the African continent, climate change is already contributing to conflict in 26 countries, from West Africa to Sudan, according to a report released last month from the U.N. Security Council. "The Security Council expresses concern over the overall humanitarian situation in the region, characterized by the impact of armed conflict and terrorism, extreme poverty, food insecurity, forced displacement, adverse effects of climate change and epidemics, which contribute to the high levels of structural, chronic and acute vulnerability in the region and continue to affect populations, and call for significant humanitarian and development action," the report says. Cape Town also offers a lesson for the United States, where key reservoirs in the West have been losing volume for decades. Currently, the snowpack in the Sierra Nevada is at just 27 percent of its historical average. And yet, even in the tense U.S. political atmosphere, there is a recognition that climate threats are not far off. At a town hall event with employees last week, Interior Secretary Ryan Zinke, who has slashed climate science programs, told his staff that he thinks water issues will be a primary challenge facing the agency over the next 25 years. "Water out West is going to be an issue," Zinke said. "We have a saying out in Montana: Whiskey's for drinking. Water is for fighting."